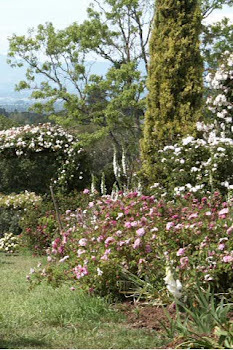 A blog on Old Roses, gardening, rose gardeners & their gardens around the world. Overheard conversations in the garden, on Dirt Day today, steered clear of politics but touched on all else in life. Laughter, discord, revelations of the power of weeds, admiration of the Hori-Hori, howls of pain at the piercing thorns of blackberries clattered in through the windows of my house filling it with the joyous noise of people who love to garden. The sad spell of doom, the stuffy smell of closed doors thinned like a vanishing fog, and sunlight entered the rose cottage again. It was dirt day and lunch awaited us, our reward for the caring of the roses. An ominous threat of the loss of all this fizzled in a heap of weeds thrust on the pathway. The garden is saved, and we must all now do our parts. The grand thing about Dirt Days---you are never sure if the great reward is smoked salmon and fried polenta, or the rush of serotonin in your brain caused by the microbes you inhale in three hours of weeding. Probably both. The grand thing about Dirt Days is the people and how happy it makes them to know they are saving these roses. If you haven't tried it, you really must. Next Dirt Day: February 25th, 10 am to 3 pm. Are you a Friend of Vintage Roses? Find your passion and make it your life. You may never pay the bills on time. You may never own a house. But your passions will flourish...in a world where roses bloom. Preserving a Garden of Old and Rare Roses—Can it be Done? In my garden I grow over 4000 rose plants of all classes and types. Like a museum of roses, the garden tells the story of roses from the most ancient to the most recent. But, unlike a museum, it is a living organism, always growing through cycles of bloom and renewal. Along with the roses live gophers, hummingbirds, pigmy rabbits, the occasional deer, and a host of other life forces—some welcome, and others not. The garden and its collection of rare roses are known by many rose lovers around the world, and have been shared with other gardeners and gardens for the past 26 years. Today it stands on the edge of disappearing, and in this blog I hope to share with you both the peril that threatens it and the effort that has begun now to preserve it. A garden is a temporary thing, it is often said, destined to disappear with its creator. But I do not agree. A garden is an idea that once experienced lives in the minds of those who can imagine it. It belongs to no one and to everyone. Once I understood this my garden began to live. It has lived for many years now in the minds of those who have visited it, and those who have only imagined visiting it. It has the power to elevate all of us to Cloud Eleven. Roses are powerful life forces, pulled from the imaginations of artists over many centuries of human existence. They speak to us, and if we listen and can hear them, they have much to say. They transcend their creators, their admirers and their custodians---they transcend us and inspire us. Their powerful sway bore fruit in a gathering of people who wanted them and heard them calling---the Friends of Vintage Roses. This scattered group began to coalesce about a decade ago one May in the garden I had built. These people have pulled together once again for the roses to keep alive a vision, a dream and an inspiration. Their hard work and pragmatism account for the survival of so many beautiful beings, and they work now to spread the word, the joy and the delight of old roses.